OH found a pretty pigeon near our bins this afternoon. 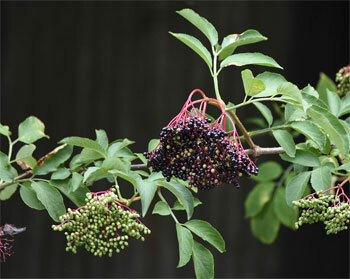 We have ring doves and pigeons all the time around the garden, splattering the paths.... However, this one has a ring on each leg, and as there is no-one in our tiny village who keeps racing pigeons now, we wonder where it came from and who the owner is. It was still in more or less the same place after tea, OH had given it some bird seed, and it had eaten most of it, and done some green poo I looked up the latter, but the info veered between being normal in a young bird (this isn't a baby), or having a sample taken to the vet. The bird's plumage is beautiful, lovely pink breast feathers. So, we are going away shortly, and for its safety, it is in the old hen run, which still contains the hut, but is now a log store. It has some food and a bowl of water. We went to see if it was still with us a short while since, and it had hidden in the back of the hut, behind some garden canes. We will see what is what tomorrow, and try and contact the racing pigeon people, or ask my neighbour to feed and water it while we are away. It has made no attempt to fly, and it is nice to have another bird around, I miss our girls, though it is three years since we lost Rosie. We once had a racing pigeon land on our patio & stay for a few days. Like you we fed it & let it sleep somewhere safe at night. Eventually we managed to read the numbers on its ring, tracked down the owner & phoned them, they said it just needed a bit of rest & told us to take it somewhere safe from traffic & release it. Well that's what I did & I like to think it made it back home. Thanks for the info Kitla. If the bird is still alive in the morning we will try and read the numbers. I see on a google site that sometimes owners ink their details on the underside of the bird's wings. Our bird was lively this morning, standing outside the hen hut, and so we have let him/her go. OH threw it up into the air, and away it went. So pleased it is OK.
We have had numerous racing pigeons and have just fed and watered them. They stayed anything between 2 days and 2 weeks, but all went on their way eventually. Some years ago I did make contact with the owner via the ring info and was told to neck it as it was no good as it had not gone back home. Needless to say I did not do that and it went on its merry way. How horrible of them Gwen! I thought most pigeon owners cared about their birds, the chap I phoned seemed to. We used to have a neighbour that kept them in a shed at the bottom of his garden, every day he'd let them all out & they'd fly round & round the field in a big flock then go back to the shed when they were tired. OH said that our pigeon's owner would probably neck it if we contacted him. Hopefully he will be none the wiser. But now we know what to do should we find another one. They do care for them, Kitla if they have any potential at winning and unfortunately that includes going back to the loft to be clocked in. Our pigeon returned this afternoon! He is quite at home under the carport, on the gravel area outside the living room window, and is flying well. He is really beautiful, a sort of pearl colour, with this beautiful pearly pink breast. My neighbour will sort him out when we are away, she is a huge fan of wildlife. 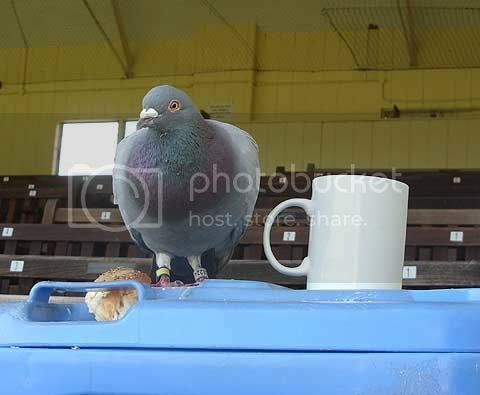 You may recall a few years back a Racing Pigeon found it's way to the Cricket Club. After the second day of it roaming the Dressing Rooms I managed to catch it and got the Number, rang the Owner who was most abrupt. "Whatever you do, DO NOT FEED IT" he said. I replied we were in the middle of a One day - 4 day and 1 Day Match with about 4,000 at the Ground each day, heaven for a hungry, tired bird. ! Anyway, after five days it went on it's way, but the way the Chap spoke to me, stayed with me. I remember that, Richard and I know what you mean about what was said staying with you as well. We have just returned from four days in Shropshire. Pigeon seems to have disappeared. We did feed it, of course, and it spent two nights in our old hen run, but seemed able to fly, and return for food when it felt like it. Ours had a white ring on one leg and a pink one on the other.